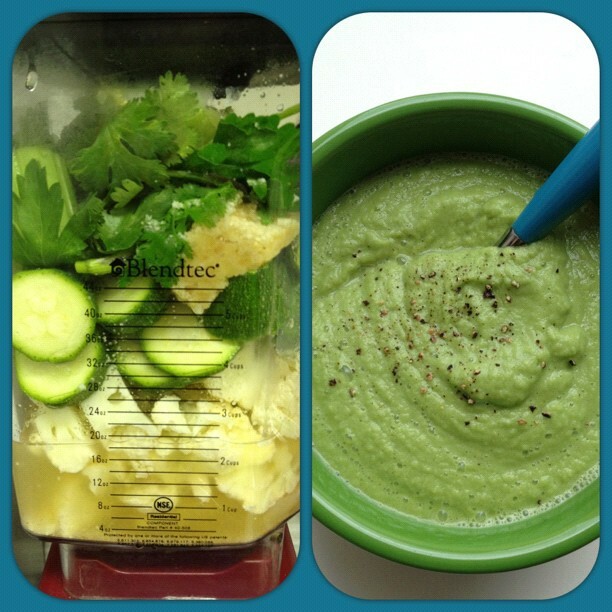 I’m starting my own first ever 5-10 day smoothie/soup feast (we’ll see how I am at 5 days if I continue thru 10). I’m very curious to see what this experience will bring me and what I will give to this experience. I’ve never made the commitment to do something like this and I’m excited! I thought about ‘allowing’ pieces of whole fruit in between meals because it’s my first time but I think I’ve decided to still pursue just blended drinks. I’m using this as a reset and re-inspire, getting back to the base of recipes that truly inspire me, which will mean MORE raw soup and smoothie ideas here! It also seems like good timing because there is an abundance of greens, zucchinis, carrots, berries, etc at the farmer’s markets right now. Today, I had a very light breakfast that was only about 1 glass of leftover smoothie from yesterday. Needless to say, hunger set in earlier today. Time for a creamy savory soup from some of our Saturday farmer’s market haul. A delicious, savory and warm soup that will take less than 7 minutes from fridge to bowl. This makes 5 cups of soup...all 5 cups could be your meal and the nutrition information for that is: Calories: 354 - Fat: 11 - Fiber: 19g - Protein: 16g - Vitamin A: 16% - Vitamin C: 411% - Calcium: 25% - Iron: 33% just to name a few, this also contains B vitamins, vitamin k, and many minerals! 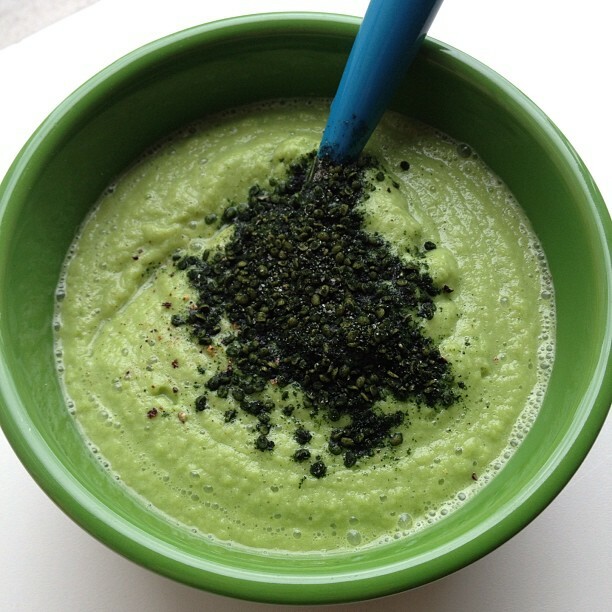 Add everything except Frank's Finest Spirulina seasoning to the blender and blend until smooth. If necessary, add more water to adjust to your desired thick/thinness and blend again. Garnish with pepper and/or the spirulina seasoning. Enjoy! *There's no salt in this recipe due to the natural sources of sodium from the miso and celery. *I boiled water in an electric tea kettle right before I started prepping ingredients and it finished boiling while I was doing that so it had a few minutes to 'cool'. We just watched the first season of Game of Thrones – thank you Portland library! Jeremy’s on book 3 and I thought I had little interest in the books, well that has changed. Just put the first one on hold at the library. I think this smoothie feast will also help me drink more water, that’s always a win. We head to Denver next week for a graduation – very excited to see family and celebrate! and hike! and share many hugs! We’re really enjoying the mid 60’s-70’s temps here while friends/family are suffering in the mid-west, mid 90 degree and humid weather. Didn’t get to saute my beet greens in garlic/olive oil before the start of my smoothie feast, so they’ll go in smoothies instead. I look forward to trying that after we get back from CO. I haven’t painted or done artwork in awhile – this is sad – must fix.